Analysis suggests the 40cm-long mole mechanism, which will measure Mars' temperature, has barely got out of the tube that was guiding its descent. The instrument is also now tilted away from the vertical. Prof Spohn said there would now be a break in operations of two weeks while the situation was assessed. The Insight probe is sitting on flat terrain close to the equator in a region referred to as Elysium Planitia. Tests back on Earth prior to the mission getting under way demonstrated that the mole could handle coarse gravel and, given plenty of hammering time, even move larger stones out of the way. So this stoppage is by no means the end of the matter. "Planetary exploration is not as easy as pie," stressed, Prof Spohn. The good news is that HP3's sensors can proceed with the first temperature measurements. The idea of the experiment is to find out how heat from the interior of the planet is being dissipated. This will give "insights" into how much natural radioactive decay is occurring inside Mars, and how much energy the planet still retains from its formation more than 4.5 billion years ago. 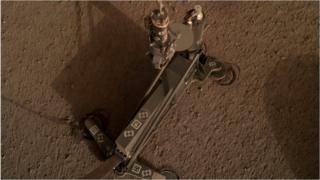 Two other instrument packages on the probe are conducting complementary investigations. A seismometer system is checking the ground for "Marsquakes" - vibrations that could come from ongoing geological activity or from meteorite strikes. And a radio experiment is being used to check if the planet is wobbling on its axis - an indicator that it might have a liquid metal core like the Earth.